And then it was suddenly over. Months of work, planning, emailing, applying for funds, booking trips, selling tickets and coming up with witty, interesting questions and themes for our incredible speakers. Always in the back of my head, nagging, pondering, visualising what it would be like. This last weekend, Glasgow Economic Foru 2017 was finally here, a little project I got involved with in early second-year that has now developed into quite something. A bold and interesting idea by upset and naïve students about bringing cool speakers to the University, expanding the very narrow (read: boring) view of what economics is/ought to be, and it has become the highlight of the year. After this intense weekend, there are so many things I wanna read, so much I want to follow up on and and so much sleep to regain. Do bear with me while I indulge in this sentimental reflection. After all, I won't be involved in organising our beautiful GEF again, as I'm spreading my wings to go elsewhere in a few months. 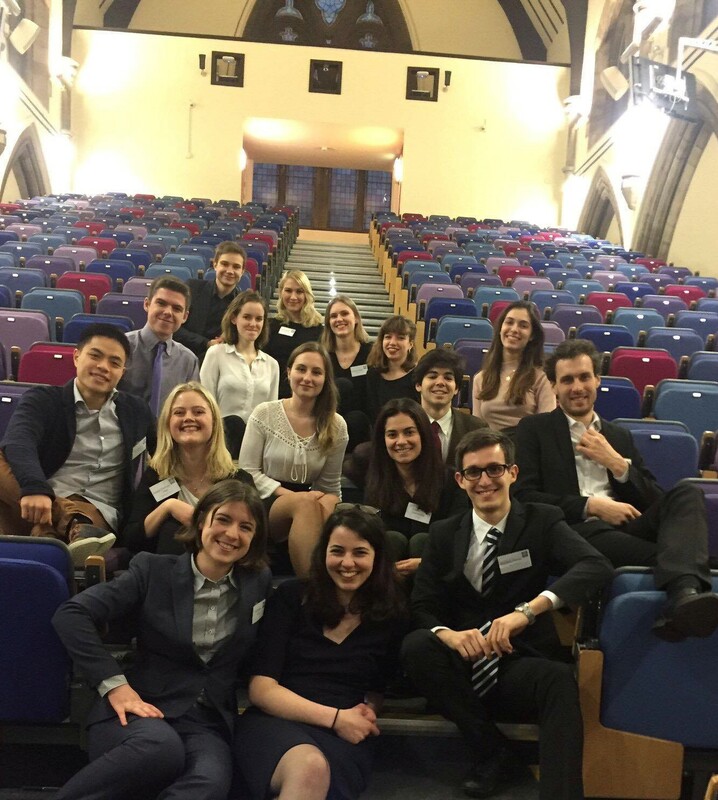 Joining up with Glasgow Economic Forum in second-year was a no-brainer. I had just returned from my first Mises University, was overwealmed with inspiration and energy and wanted to do absolutely everything in my power to advance my learning. GEF was an excellent opportunity for that. It wasn't until much later that I managed to gather my thoughts into coherent stories about why a wide-ranging, pluralistic understanding of our discipline mattered. Regardless of how much I loved my time in Australia, my studying abroad at the University of Sydney, the one thing that held me back, the one thing that made me consider staying in Glasgow was the enthusiasm I had for this conference and the vibrant community of economics students that has developed here. Imagine my enthusiasm then for re-connecting with this crowd coming back. In addition to dissertations, master's applications and qualms about the future, I was gonna help make this conference pretty great. So how did we do? The line-up was quite stellar, including a handful of the most well-established experts in their respective fields (Hülsmann, Crafts, Shaikh, Standing and many more). What I believe may have been among the most surprising experience for the audience this year was how much our Austrian and Marxian economists agreed with one another. Blinded by ideological priors, we often assume that they'd be on opposite sides of the spectrum – and in many ways they are – but once we take a step back, listen and engage in productive discussions, we find that many strands of the heterodoxy share similar and healthy scepticism of the methods and conclusions of the dominating orthodoxy of economic thinking (I do wish they'd stop saying 'Neoclassical' economics, though...). Hülsmann and Shaikh may have agreed more than we wanted, reflecting our failure to spark controversy; honest intellectual discourse and entertainment can sometimes involve a tradeoff, and I suppose we may have erred on the former side this year. fashionably dressed in my Mises tie. Anwar Shaikh, among the few marxian/classical economists I admire, came all the way from New York to spend a few days with us. This incredible academic, not much taller than a hobbit, fills the shoes of countless intellectuals. He presented some conclusions and approaches in his masterpiece Capitalism (and generously provided us with a 30% discount...), most of which I had heard and read him argue before; that his approach is real and empirical, escaping the perfect-vs-imperfect sort of debates New Keynesians have been involved in; that he's creating a comprehensive framework, alike the economic treatises of ages past; that he believes the profit motive is the guiding principle, not only for investment but for many other macro and micro variables (relative prices, competition, aggregate demand/supply and migration patterns); that real economic systems overshoots and undershoots around a constantly-moving equilibrium rather than instantly and effortlessly jumping between equilibria. His focus on empirics is impressive, and includes much economic history: "As economists", Shaikh said, "we must be able to explain outcomes". He gave us two crucial tips for future studies, (incidently what the New School in New York, where he teaches, does): take courses in other disciplines, i.e. broaden your mind; and read the originals, Adam Smith, David Ricardo, Marx, Menger, Hayek and of course Keynes. Holding share-holders to account: the 19th century practice of unlimited (and later double or extended) liability made owners very wary of losses, and hence ensured that banks were run prudently on very high capital-to-loan ratios, high reserve ratios, preventind what he calls risk shifting – he showed us this intimidating downhill chart of how bank deposits have been covered by less and less capital, and how this was a government-induced development beginning after the CGB crisis in 1878. Government repressive finance: Coupled with the fall of unlimited liability was the rise of extensive government regulation, in the particular way it was done in Britain. As governments have almost always done after wars where they incurred large-scale debts, repressing the financial system, forcing them to hold and buy government bonds (or even monetise it), making large government debt manageable. When either is present, banks don't crash seriously enough to threaten the rest of the economy or even the financial system (which explains the very mild recession Britain faced during the Great Depression). The downside of having either of these two conditions are of course that they incur large (oppurtunity) costs to banks' primary purpose of credit intermediation (probably moreso the second than the first). Turner, striking me as somewhat of a pessimist, sensible hides behind an explanation of "political inability" for why neither of these conditions can be re-introduced in today's world, condemning us to get use to recurrant banking crises. When I pushed him, he accepted that probably a little of both must happen to make banking less stable. The most exciting part of his lecture, apart from his charming style and great connection with his audience, was the very appropriate quotes he had extracted from almost a century ago, about how excessive regulation would create a moral hazard requiring "all the financial resources of the nation mobilised to bailout banks". Nicolas Crafts, one of these great economic historians everyone reads at one time or another in their career, was kind enough to join us for two days. As I said in my rushed introductory remarks, he's one of Britain's foremost experts on economic growth, very good at delivering a serious message in an entertaining way, and incidently very funny, British-style – and pretty good at making my tiny attempts at economic history seem like silly before-breakfast-morning-excercises. 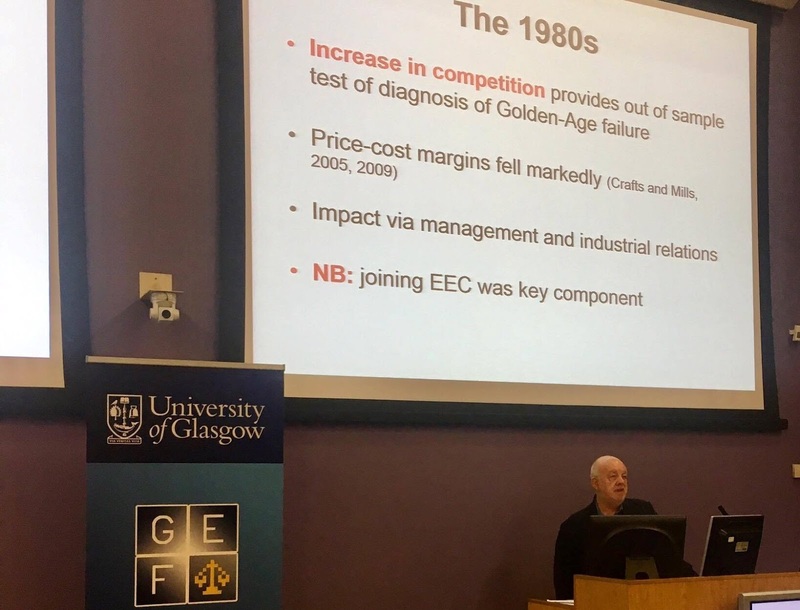 He initially told us the familiar story about British economic growth, of how other European countries "overtook" Britain in terms of GDP/capita during the 20th century, how some of that can be explained by harming institutions and lack of competition following the turn to protectionism in the 1930s (the connection to Trump is evident). He then discussed growth accounting briefly, including an adjustment for falling mortality risks over the last century, and ended on the fashionable discussion that is "Secular Stagnation". Again showing his brilliance, he described Robert Gordon's famous thesis from last year, and then decimated it masterfully. He also touched on how the fear of robotisation is more akin to the mistaken Alvin Hansen-story (original "secular stagnation") from 1939 than the serious threat its made out to be. Then of course, bonus points for joking about the collapse of pension schemes! I should include all the brilliant sessions we had (and I probably will over the course of the next few weeks), but will settle for now. 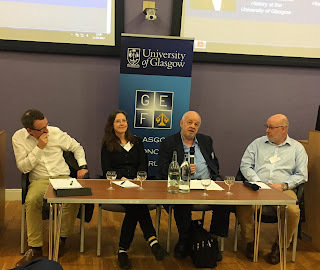 I do need to comment on the session I most enjoyed however, which naturally was the panel discussion I chaired on the Value of Economic History in Economics. Of course, I completely fan-girled, having to critically discuss and question John Turner and Nic Crafts (see above) as well as two of our best lecturers/professors here at Glasgow: Duncan Ross and Catherine Schenk. Tongue in cheek calling them academic "losers", Peter Temin-style, (video available here) was made with the warmest of friendly intentions. They said a lot of great things, music to my ears, about why economists should care about economic history beyond playing ground for models: disproving the most bizarre misconceptions of the past, improving current policy-making (as Schenk said "if this policy didn't work in the past, what makes you think it'll work this time? "), understand precision and surprises of the real world.